Elvis Presley was always drawn to Chuck Berry’s music. Presley sidekick Jerry Schilling saw it happen spontaneously one night in 1972. Schilling was with Elvis and Sammy Davis Jr. as they walked through the lobby of the Las Vegas Hilton. “We heard a very familiar Chuck Berry intro,” Schilling recalls. “And Sammy and Elvis just looked at each other, and with a smile, we all just turned around without anything being said, and we headed for the lounge.” After taking a booth in the lounge where Chuck was playing, Elvis began yelling out song requests. Some of those titles Elvis had himself recorded during his career. Presley’s first studio recording of a Chuck Berry song was an informal one. During the legendary “Million-Dollar Quartet” session at Sam Phillips’s Sun Records studio on December 4, 1956, Elvis sang three segments of “Brown-Eyed Handsome Man,” a recently released Berry single on Chess Records. Strangely, considering that “Memphis” is now considered a classic rock ’n’ roll tune, Berry’s original 1959 recording did not chart on Billboard’s Hot 100. 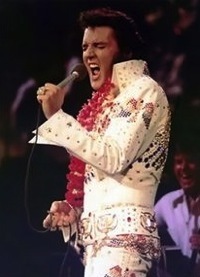 Still, the tune was a natural for Elvis to record, considering lyrical setting was his hometown. Berry, however, born and raised in St. Louis, revealed in his autobiography that he had no special connection with Memphis in mind when he wrote the lyrics. Guralnick said “Memphis” was a song in which Elvis “truly believed” and “he felt it could be one of his strongest singles in years.” His hopes were dashed, however, when Johnny Rivers released a version of the song ahead of Elvis. When Rivers’ recording went all the way to #2 on the Hot 100, Elvis knew it would appear exploitive if his version of the song were released as a single. Presley’s recording of “Memphis” was finally released in 1965 as one of the assorted cuts on his otherwise forgettable “Elvis for Everyone” LP. 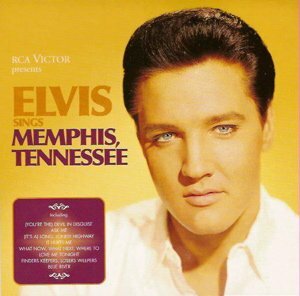 In his 1999 Presley biography, Guralnick reported that Elvis felt betrayed by Rivers, who he believed rushed his version of “Memphis” out after Elvis told him he intended to use the song as his next single. In their subsequent tell-all books, almost all of the guys in Elvis’s inner circle have supported this view. Johnny Rivers spoke out immediately, however, criticizing Guralnick and denying he had “sucker punched” Elvis over “Memphis.” Chuck Berry issued the following statement in support of Rivers. 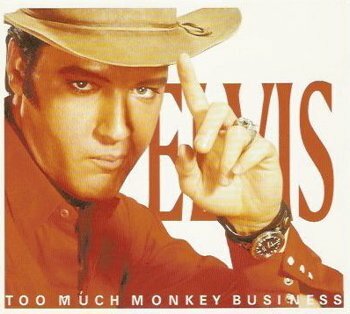 As with “Memphis,” Elvis’s recording of “Too Much Monkey Business” first appeared on a rather obscure LP of assorted recordings—“Elvis Sings Flaming Star”—sold at Singer sewing machine stores to promote Presley’s NBC-TV special in 1968. “Arguably Berry’s greatest artistic triumph and one of the most widely known rock songs in the history of the genre,” according to biographer Pegg, “Johnny B. Goode” was one of Berry’s most successful chart records, reaching #8 on the Hot 100 in 1958. 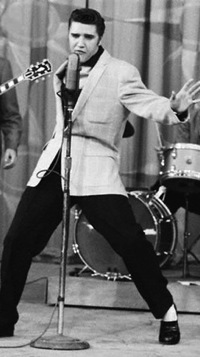 Elvis never recorded “Johnny B. Goode” in the studio, but it was recorded numerous times during his stage show in Las Vegas and while on tour. 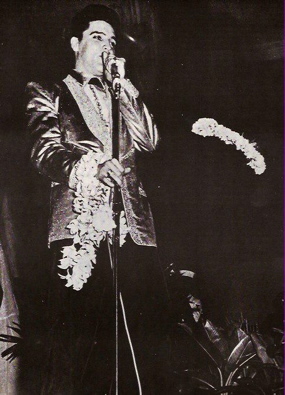 It was included in his “In Person” live album from his initial appearance at the International Hotel in Las Vegas in August 1969. 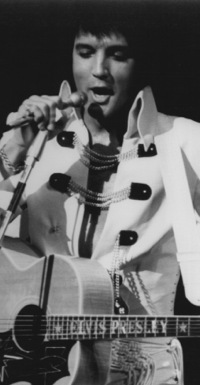 Another recording of “Johnny B. Goode” played over the opening credits to Presley’s 1972 Elvis on Tour documentary, and he sang it again in his Aloha From Hawaii TV special the following year. Strumming to the music that the driver made. “Promised Land” was the only Chuck Berry composition that Elvis Presley released as a single. Berry wrote the song while incarcerated in federal prison in 1961-62 for violating the Mann Act. He recalls that prison officials were reluctant to help with his latest songwriting project. After being paroled, Berry recorded the song at the Chess Records studio in Chicago on February 20, 1964. Released as a single, “Promised Land” spent seven weeks on the Hot 100, reaching #14. Nine years later, Elvis recorded his version at Stax Studios in Memphis on December 15, 1973. 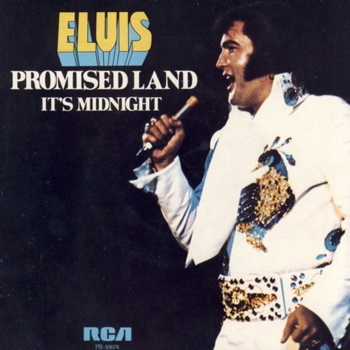 Released the following year, Elvis’s version of “Promised Land” performed better on the charts than Berry’s had. It spent 13 weeks on the Hot 100, peaking at #14. Rollin’ cross the Georgia state. 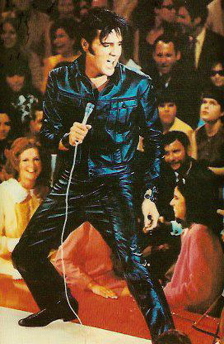 Meanwhile, starting in 1968, Elvis Presley would revitalize his career with a landmark TV special and a return to live performances. Their 1972 early-morning encounter at the Las Vegas Hilton—where Elvis played to thousands in the main room while Berry played to dozens in a cocktail lounge—revealed the different directions the careers of rock ’n’ roll’s two great icons had taken. If record chart history were the sole indication of influence, then Elvis Presley certainly deserves the title of the King of Rock ’n’ roll. By their 1972 meeting, Elvis had accumulated 122 Hot 100 recordings, including 38 top 10 sides and 14 #1s. 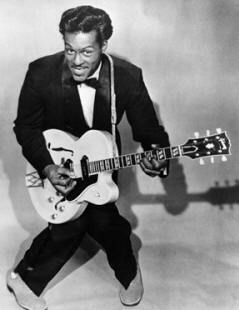 Meanwhile, Chuck Berry placed just 26 songs in the Hot 100, including 6 in the top 10, and a single chart-topper.